Calmetrics Inc. of Holbrook, New York develops and manufactures certified reference standards for X-ray fluorescence (XRF) instruments. This ISO 17025 accredited company was founded in 2002 and occupies a 3,300 square foot facility on Long Island in Suffolk County. The company has nine employees and sells its products domestically and overseas. Calmetrics Inc. of Holbrook, New York develops and manufactures certified reference standards for X-ray fluorescence (XRF) instruments used in the quantitative analysis of film thickness and material composition. The nine-person company was founded in 2002 and occupies a 3,300 square foot facility in Suffolk County on Long Island. Over 50% of Calmetrics’ sales are exports. Calmetrics’ products include thin chromium foils that are used as reference standards for calibrating XRF instruments. There are only three ways to make these foils: electroplating, mechanical rolling, and physical vapor deposition (PVD). Each manufacturing process presents challenges and limitations with respect to chromium coatings. For example, PVD can introduce material stress and discoloration. The hardness of chromium makes the mechanical rolling method impractical or, at the very least, results in non-uniformity on a microscopic scale. Electroplating results in highly-stressed and fractured layers, making foil integrity problematic. In 2013, Calmetrics attended a FuzeHub Solutions Forum on Long Island. There, the company shared contact information with Cornell University’s Center for Materials Research (CCMR). After the event, Calmetrics received regular CCMR updates via email. Calmetrics is accredited to ISO 17025, an internationally-recognized standard for laboratory testing and calibration. Reference standards that are NIST-traceable ensure that the manufacturer’s products (such as chromium foil) are traceable to references available from the U.S. National Institute of Standards and Technology (NIST). Calmetrics needed to maintain its competitive edge against foreign competitors who enjoy access to low-cost technical labor, research and development (R&D) funding, and university resources. The company needs to meet both U.S. and international standards, such as ones from the European Union (EU). Frank Ferrandino, Calmetrics’ President and Technology Director, learned about CCMR’s Shared Facilities program and traveled to Cornell. Under this program, non-University researchers can access world-class materials analysis and processing equipment. For small companies, these high-end tools are typically too expensive and used too infrequently to buy and bring in-house. Ferrandino was especially interested in CCMR’s surface characterization instruments, but he also learned about a valuable opportunity from John Sinnott, CCMR’s Industrial Partnerships Manager and a FuzeHub team member. Under the CCMR JumpStart program, awarded projects receive up to $5,000 in matching funds for project costs such as faculty and research staff, facilities, services, supplies, and materials. Calmetrics completed Shared Facilities training during the spring of 2015. The company then applied for and won two JumpStart awards. Calmetrics first Jump Start award (August 2015) involved the development of chromium-foil reference standards that none of its competitors can offer. Today, the stress-reducing PVD process that Cornell scientists helped to create supports Calmetrics production on CCMR’s shared equipment. Calmetrics’ second Jump Start award (January 2017) involves the development of reference standards for NIST-traceable calibrations used for screening and verification in compliance with the EU’s Restriction of Hazardous Substances (RoHS) directive. 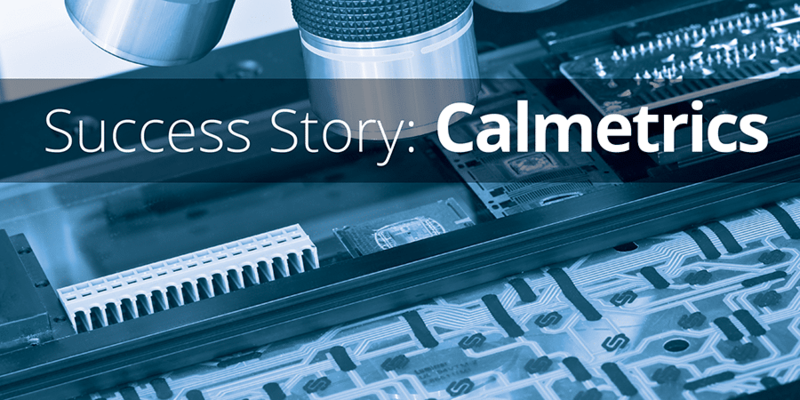 With help from CCMR and FuzeHub, Calmetrics has gained a competitive advantage and reinforced its position as a “one-stop shop” for reference standards in a crowded global marketplace.